The technology known as CRISPR — clustered regularly interspaced short palindromic repeats — has taken the field of synthetic bioengineering by storm. It emerged as a gene-editing tool only five years ago, but has become a familiar presence in the lab. 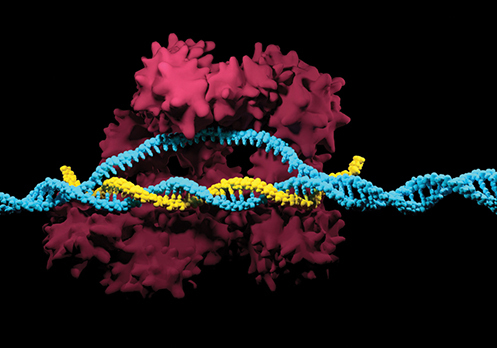 CRISPR-Cas9, the full name for the editing system that uses the Cas9 enzyme as a molecular scissor, cuts DNA at any desired location. CRISPR’s versatility makes it a popular tool for current and future research projects. Engineers and scientists are using CRISPR to modify and repair DNA in single organisms, create cell and animal models to help accelerate disease and clinical research, and develop CRISPR-based gene drives that can disrupt the spread of animal-borne diseases. Researchers have used CRISPR to engineer a gene drive in mosquitos to disrupt the spread of diseases such as malaria. In a wild population, a gene mutation that inactivates malaria in a single mosquito will be passed to about half of that mosquito’s offspring. Mutations made with CRISPR can be passed to almost all of the offspring, enabling exponential growth in the mosquito population without malaria, and potentially creating a malaria-free community. Regions such as Mexico, Brazil, and most of Africa could benefit from the elimination of malaria, which causes numerous deaths each year. Although CRISPR can enable and accelerate developments in many different research areas, patent wars and ethical hurdles must be overcome. For example, the overall short-term and long-term effects to an ecosystem due to a mutation in an organism with seemingly positive benefits are unclear. At the Wyss Institute, George Church and Kevin Esvelt have developed biosafety measures for laboratories to reduce the risk of adverse effects due to gene editing. Church and Esvelt recommend having at least one molecular confinement mechanism in place, such as a split gene drive, artificial target sequence, or reversible gene drive. A reversible gene drive is a newer molecular confinement mechanism, which demonstrates that a gene drive can be used to remove an intentional mutation. As research is conducted to move gene-drive technology outside of a confined laboratory space, safety considerations will begin to play a larger role. ▲ The CRISPR-Cas9 system (magenta) cleaves the DNA target (blue) at the specific site located by the single guide RNA, or sgRNA (yellow). Biochemical and chemical engineers have found applications for CRISPR in industrial biotechnology. Caribou Biosciences, a biotechnology company, has introduced CRISPR-Cas technology into its industrial fermentation processes. Industrial fermentation is key to enzymatic growth and production of various chemicals. CRISPR is able to enhance the strain production and increase fermentation, which increases the concentration of enzymes. Caribou intends to use CRISPR to create customized microbes to produce chemicals and enzymes, including fragrances, flavors, and cleaning products, that cannot be produced using traditional fermentation processes. CRISPR technologies are beginning to progress to clinical trial phases. Bioengineers at CRISPR Therapeutics, a company focused on developing transformative medicines, is using the CRISPR-Cas9 platform to open avenues for numerous disease treatments. Their first treatment, called CTX001, targets beta thalassemia and sickle cell diseases and will enter clinical trial Phases I and II this year. Beta thalassemia is a blood disorder that inhibits hemoglobin (the protein in red blood cells that carries oxygen) production in the body, lowering red blood cell count. Patients are traditionally treated with regular blood transfusions, but CRISPR has the potential to eliminate the need for transfusions. The CRISPR movement is revolutionizing the way engineers and scientists tackle problems by enabling novel and life-changing treatments. Research efforts related to CRISPR are increasing each year. The International Conference on CRISPR Technologies, hosted by the Society for Biological Engineering (SBE), will take place Dec. 10–12, 2018, in San Diego, CA. The conference will bring together leaders and trainees on the cutting edge of CRISPR technologies and applications to discuss research and its implementation.